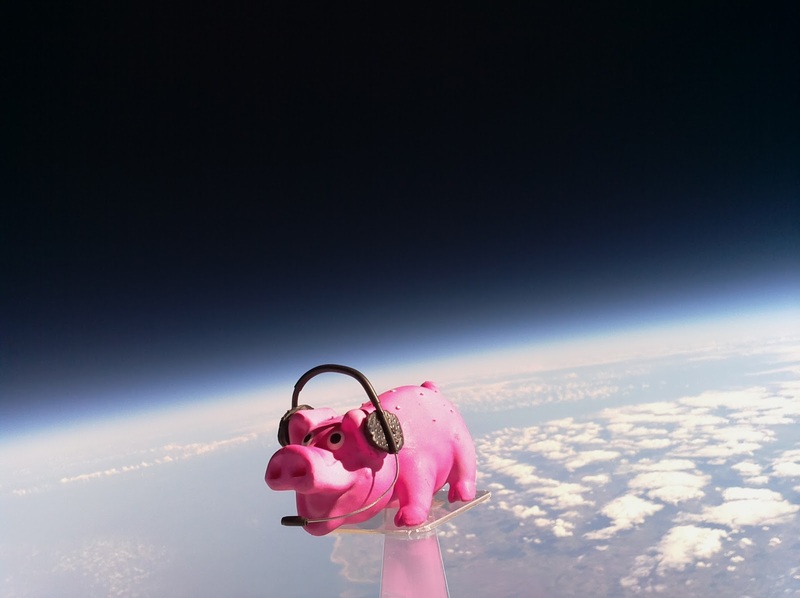 The National Hamfest high altitude balloon flew on Saturday and Pinky Pig reached a maximum altitude of nearly 26km (25,927m / 96,873 feet) as pictured above. The flight originally planned for Friday had to be postponed due to wind direction and restrictions but I had sort approval for both days and was able to fly on Saturday. The conditions were perfect on launch day, clear blue sky with little cloud and almost no wind. Flight prediction put it landing around 25km away. Both payload trackers worked flawlessly, PINKY the high speed RTTY successfully sent SSDV as well as telemetry and the backup tracker PIGLET sent the slow speed RTTY telemetry. Trackers from all over the UK as well as France, Holland and Poland received data and uploaded data to the UKHAS website. The flight can be seen visualised in Google Earth below and while the 26km altitude was impressive it was around 4km less than I’d planned. The launch certainly created a great deal of interest at the Hamfest, on the Friday we setup the club tent for South Kesteven ARS with a tracking station and demonstrated the payloads to interested visitors. 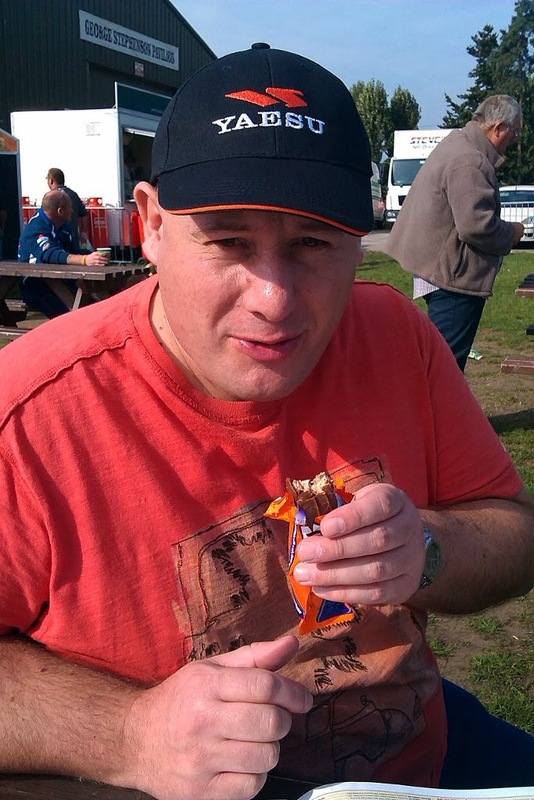 Stewart (M0SDM) used his Land Rover with a push up mast for a pair of collinear X-50s so we could receive and decode. The mast and the Land Rover generated just as much interest. Once filled to give the correct lift I sealed it off and checked everything was working then without a breath of wind slowly let the balloon rise, taking the weight of the payloads and once I was sure there were no aircraft flying nearby I let her go. The sky was clear and the balloon went up near vertically and could be seen for quite a long time as it ascended. Representatives of the RSGB and RadCom were in attendance to take photos and did a quick interview. The tracking station was then full of people as the telemetry and pictures started to be received. It was great to see the huge interest in the balloon. As the balloon started to near the planned maximum altitude I began to get ready to set off to recover it then suddenly I was told it had burst sooner than expected. I got a hurry up at which point the laptop and mobile connection decided to stop working! However I knew where to head off with my poor brother trying to sort it out as I drove. Stewart telephoned and gave me directions of where the live prediction and tracking had put the landing spot. My wife also set off from home to come and assist. In the car we were receiving a signal but were struggling to decode and couldn’t get on the internet to check the tracking. I eventually pulled up near the landing zone, while trying to decode the weak signal another car pulled up with two radio amateurs who had been tracking the balloon. I was a little preoccupied and they eventually said they were off and wished us luck. I then realised we were the wrong side of the hill and turned around and drove up to the top and the signal strength increased. Stewart had phoned to tell me to find the Viking way footpath, as we reached ground zero we saw the other amateurs car and they were setting off down the footpath! It was my flight I wanted to be the first to find it! My wife then pulled up and was about to set off after them! Then I started getting successful decodes! With the new landing position in the GPS my wife raced off in hot pursuit as I sorted out the car and then followed her with my brother. It was a reasonable walk of around 800m and as we got near it became apparent the other team had been using the online tracker and had only got the last received position which had been sent from around 254m altitude. However the payload was still transmitting strongly and we were decoding it and it was reporting it was in fact at 115m altitude – they were therefore several hundred meters in the wrong direction. Our accurate location gave us the edge and a quick hop up a bank into a stubble field and a 200m jog my brother spotted the parachute… we had found Pinky and Piglet and got there first! PIGLET had landed as planned and tested, I had put the battery pack at the top of the box the top heavy center of gravity causing it to roll on landing so the antenna would be upright. It was in a perfect orientation hence the strong signal. The other chase team turned up and congratulated us then left… my apologies but I was in my own little happy place to be sociable. We then then had the obligatory team photograph before setting back to the Hamfest. It has been an excellent experience and adventure. The pictures are better than I could have hoped for! Thanks to my understanding wife, my brother David and Stewart for setting up the antennas for the tracking station and manning it on his own while we went off to recover the payload. Thanks to the organisers of the National Hamfest and Graham Boor (G8NWC) for asking me to do the flight and helping fund the venture and I hope it succeeded in publicising the event and the hobby. Given the latest flight path prediction, weather forecast and approval restrictions I will unfortunately have to likely postpone the National Hamfest high altitude balloon till Saturday. The forecast for tomorrow is strong gusty winds at ground level which isn’t ideal for launching, but that is the least of the issues. The current flight predictions for tomorrow are not good. The prediction model used is accurate and for the size of balloon I have and the amount of helium at my disposal even a maximum fill giving the maximum ascent rate and assuming the calculated decent rate for the parachute it is still putting the likely landing right on the coast. Earlier in the week the landing wasn’t quite as marginal but as the model’s data set have been updated it has drifted further eastward, it is odds on it will actually land out to sea. However the real show stopper was when I received the CAA approval for the launch this morning. They have put a restriction not permitting a launch if the balloon and payload is likely to go on a North Easterly or Easterly path that could interfere with operations on local military airfields. This is the predicted flight path, generated by the CUSG Landing predictor at predict.habhub.org and the flight path currently goes directly over RAF Cranwell but not at a high enough altitude. There would be no issues with the airfields for that flight path and has the advantage of going almost straight up and landing close by. Apologies to those wanting to track on Friday, but the situation is out of my control and I would be foolhardy to ignore the prediction and it is very unlikely it will change significantly to allow a flight tomorrow so I hope you can all track on Saturday. 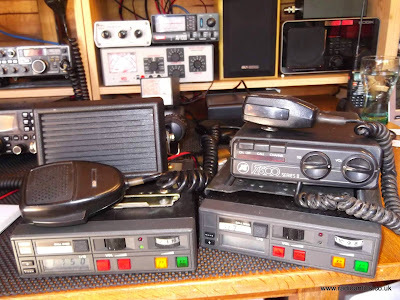 I will still be at the Hamfest tomorrow with the equipment if you want to know more about what it is all about. Not long now! Just three days left till the National Hamfest and hopefully the launch of my second high altitude balloon. Balloon, parachute and helium have all been purchased and payloads have under gone final testing and have been put to one side ready for the flight which should hopefully be around 12pm on Friday 25th September. The SSDV payload callsign PINKY will transmit on 434.575MHz USB RTTY 300 baud 880Hz shift ASCII-8 no parity 2 stop bits. I have already detailed the PIGLET payload in an earlier post. The PINKY/PERKY payload is constructed on strip board and was originally meant to to be a prototype, hence the rubbish layout. I had planned to build a better laid out version but the tight time scale, stresses and demands of work, commitments with the radio club not to mention nursing the wife as she recovers from a major operation scuppered that plan. Being pragmatic I decided it didn’t need to be work of art to work! I have secured all the connections with hot glue and it has been drop tested several times. “Pinky” pig will be the passenger on the day, donning his fetching headset. Getting him in the right position for the camera was tricky. I am still waiting for the CAA approval, should hopefully get it soon. I have put in a request for both days of the Hamfest just in case, the latest prediction at predict.habhub.org shows if I get the fill right I might just escape a watery landing on Friday, however Saturday looks more promising at the moment – also the forecast for Friday at the moment also has strong gusty surface winds, which could make the launch problematic. I am still planning for Friday since conditions and predictions do change. I and other members of South Kesteven ARS will be in attendance with a tracker station on the day, so please introduce yourself and perhaps join the club? Please don’t mention anything to do with other pigs in the news.. Already a week into September and not long now till the National Hamfest where I and the South Kesteven ARS are launching a high altitude balloon launch subject to CAA approval. The documents have been submitted so just waiting for the nod. Similar to the Eggsplorer-1 the main tracker will be a Raspberry Pi fitted with a camera and two transmitters. The tracker is based on the “Pi In The Sky” code base/design by Dave Akerman (M0RPI) and Anthony Stirk (M0UPU) with some modifications since I am building on simple strip board using a different GPS module/interface and omitting any power supply monitoring. On the Eggsplorer I used an old Pi Model B but was forced to butcher it to reduce the power demand by desoldering the network/usb chip. This time I am using a Model A+ which is smaller/lighter and has a much reduced power demand and with the locking micro-SD card socket will hopefully prevent a repeat of Eggsplorer-1’s failure mode. PINKY & PERKY are progressing well, just waiting delivery of some strip board and they should be completed in the next day or so. PINKY will be 300-Baud RTTY, sending telemetry along with SSDV image packets using the UKHAS format. PERKY will be using one of the LoRa modules again sending telemetry and SSDV but with greater resolution and speed, but will require a LoRa receiver/gateway (see Dave Akerman’s website). While the SSDV is attractive to tracker enthusiasts the high speed RTTY is more difficult to receive, so I will be flying a secondary ‘backup’ tracker. 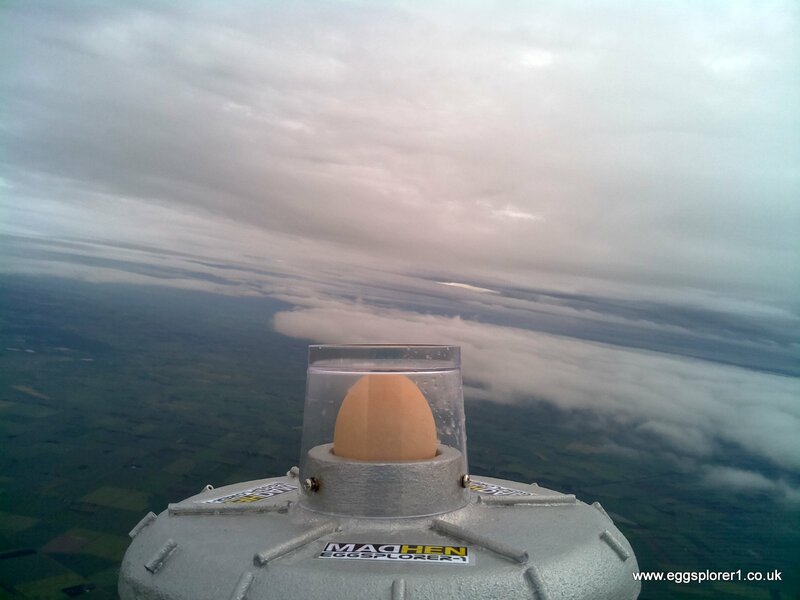 The use of a backup proved invaluable on the Eggsplorer when the main tracker failed. 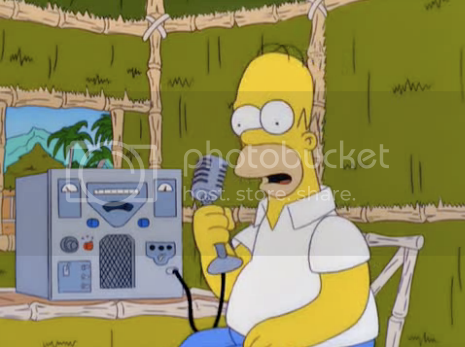 PIGLET will be a 50-baud RTTY transmission with telemetry and should prove easier to receive. Again built on strip board it is based around the ATMEL ATMega128 micro-controller using the Arduino system with a number of off the shelf modules connected to it. It has one of the GY-GPS6MV2 GPS modules I blogged about last year feeding into the UART. The NTX-2B transmitter (frequency agile version from Hab Supplies) and a I2C BMP180 pressure/sensor module (not visible as mounted to measure external conditions) It also has a small boost converter to supply 5V and extract all the available power it can from the 3-AA lithium battery pack. One change compared to the EGG1 tracker is to use a PWM output from the Arduino to generate the RTTY tones rather than a register voltage divider (guide here) which seems to give a cleaner signal. The antenna is simply copper wire making a 1/4 wave ground plane. The ‘box’ are some layers of styrofoam glued together with UHU-Por with duct tape, some straws and beads for safety. Just needs the batteries fitting and the lid fixing with more duct tape and PIGLET is ready to fly. Full details of frequencies will be posted nearer the time. MADHEN Eggsplorer-1 – We’ve got the data! 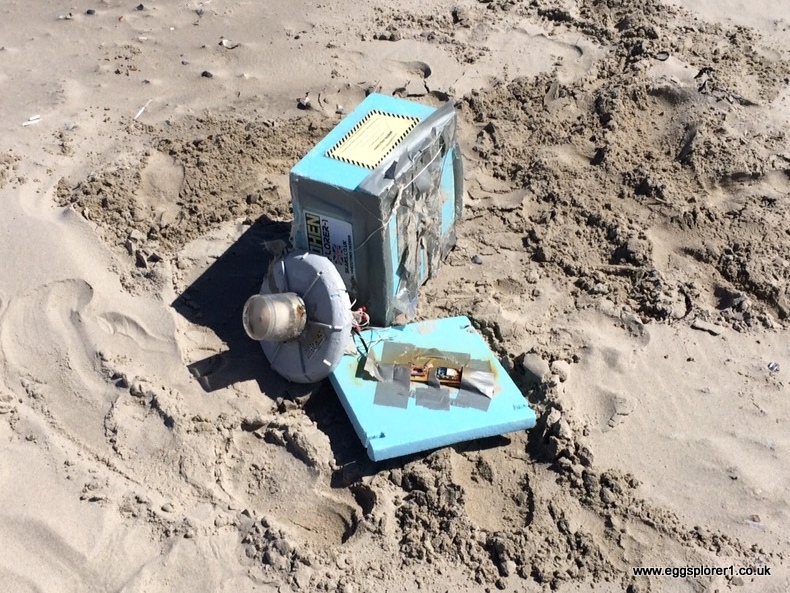 Following the euphoria of the Eggsplorer-1 payload being found six weeks after launch washed up and retrieved from the beach in Terschelling, Netherlands it has been an agonising wait to see what the Dutch police would send back. My impatience got the better of me last week and I contacted them directly to be told that unfortunately due to the awful smell and condition of the box they had simply removed the memory card and had posted that back as requested. More days past and I was beginning to think irony was going to play a cruel trick and the card after its fantastical journey would end up lost in the post. I shouldn’t have been so pessimistic as it arrived today! Along with the card was a detailed map showing the final location and labels from the side of the box. There was a nice note from the police. The SD memory card seemed to have had survived more or less intact, though there was some corrosion on the contacts and crucially a small corner of the card was broken off. I was encouraged when I inserted the card into my Microsoft Windows laptop and it was detected, however my heart sank when any attempt to access it or use the imager program was met with an error. I gave it another gentle going over with the wire wool and thankfully was then able to make a image file, the next stage was to extract the precious data. The card of course contained the Linux based Raspberry Pi file system and in order to access it on a Windows machine I used the freeware linux-reader from DiskInternals which allows access to Ext2/Ext3/Ext4, HFS and ReiserFS file systems within Windows. It was a simple case of using the “mount image file” option and the partitions were then accessible and everything appeared intact, there were images on the card unfortunately not the “egg in space” image I wanted, just some nice “egg in the clouds” shots. The telemetry log file confirmed the worst, the flight computer had indeed stopped/crashed at approx 2.5km up and no further images had been captured of the 31km accent into the stratosphere (confirmed by the backup tracker) I had hoped the transmission had stopped because of a fault in the antenna or the radio module board alas this wasn’t the case. On the day of the launch I did have problems with the payload not booting up. It had worked flawlessly under test the previous weeks and I had secured everything in the box ready for the flight. The day before the launch I had spotted there was another balloon going up in the UK at the same time and we had both opted for the same frequency. So at the eleventh hour I was forced to take out the SD card to change the configuration to prevent the transmission clash. The launch day start up problem was the SD card. I had removed and reinserted it to get it to start up and secured it down with plenty of gaffa tape. Looking at the card now and the fact the broken corner is old damage I am convinced this is the reason for the failure as the card may well have become dislodged due to turbulence. While slightly disappointed it is still a miracle I have any images at all and can only thank Jan and the Dutch Police again. 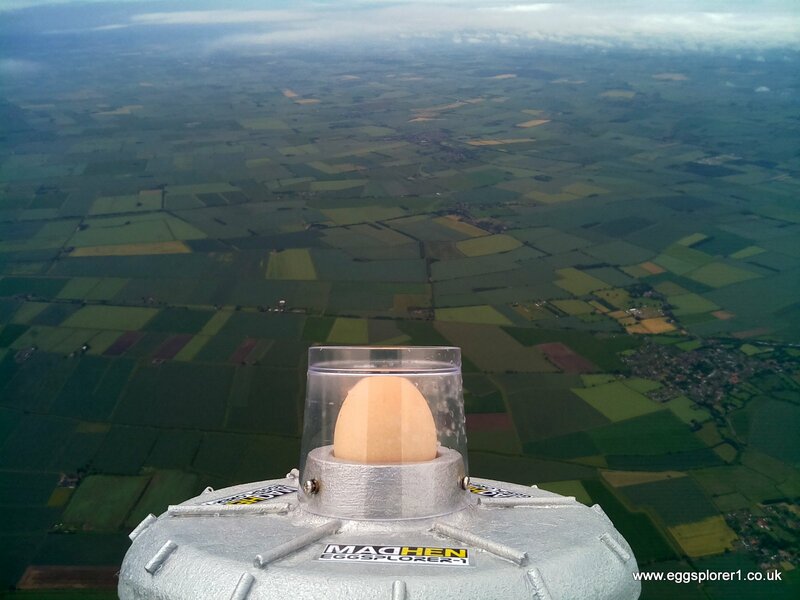 Following my maiden high altitude balloon launch last month of MADHEN Eggsplorer-1 at the World Egg Throwing Championships I have agreed to attempt another launch at this years National Hamfest which takes place on the 25th-26th of September at the Newark Showground. Once again I will be assisted by the members of South Kesteven ARS and hopefully this time it won’t end up splashing down and being lost at sea. As to any special payload? 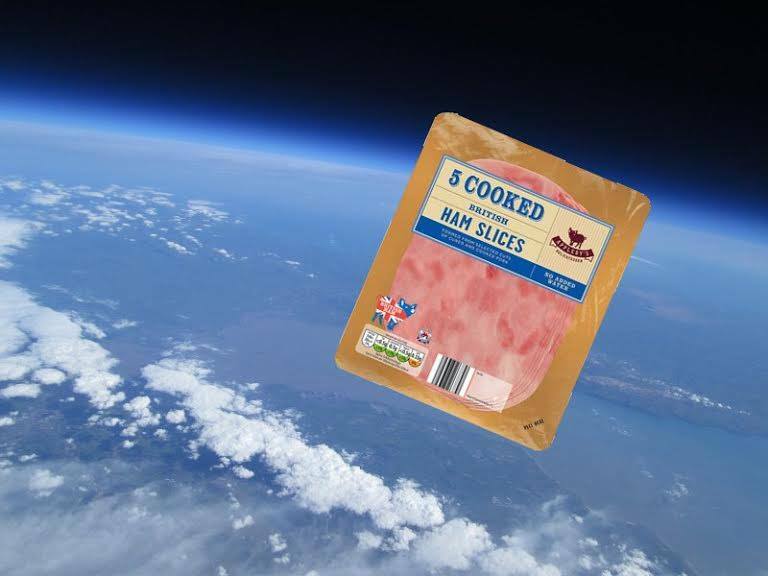 Well following the yokes about “Ham n Eggs” following the sending of an egg in the stratosphere, who knows….? The shack has gained a couple of ‘new’ radios, one of them look familiar? It is the Trio/Kenwood TR9500 that I repaired last month for a fellow club member. Having no transmit audio I’d replaced a faulty transistor in the microphone pre-amp. Subsequently it’s owner reported it was still misbehaving and locking up in transmit mode. I’d offered to give it another look but the owner decided to cut his losses and wanted shot of it. He had just purchased a nice new radio at the National Hamfest and was also selling a 2m Trio/Kenwood TR9000 multi-mode set to make some room. I liked the look of these pretty sisters and got both of them for a very reasonable price, the TR9500 costing just £10 in lieu of the previous repair work. I collected them at the weekend and got around to checking them out last night. The TR9000 is a lovely compact rig, the case has the odd scuff but the front is in good condition and has cleaned up nicely. I just need to attend to the microphone plug as it wearing the ubiquitous piece of brightly coloured insulating tape. 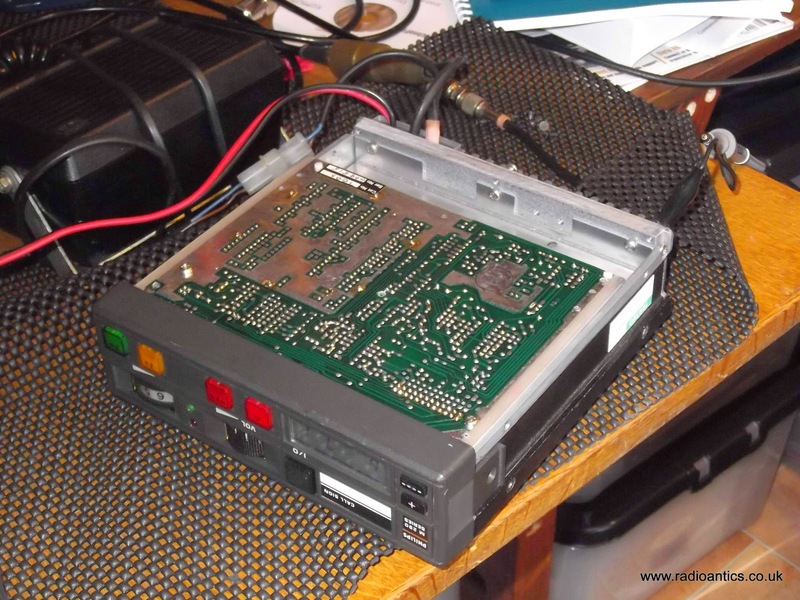 It is fully functional and I made a few contacts on it during last nights 144MHz UKAC. It is nice sounding and seems to have a good sensitive receiver. The troublesome TR9500 has been back on the bench and connected to a dummy load and my X-50 dual-band collinear and I cannot find anything wrong. The ALC ‘issue‘ I suspected was a red-herring, the audio does cuts out and the S-meter goes to S9 but only when the RF gain knob is turned to minimum not maximum as I’d thought, the same thing happens on the TR9000. It is entirely possible the fault reported by its previous owner is intermittent (a bad joint, sticky relay etc) It is also a possibility that RF was leaking back in the rig causing it to lock up. I plan to use it in anger maybe during next weeks 432MHz UKAC especially if the receiver proves as sensitive as that in the TR9000. As I mentioned the National Hamfest took place recently and since it is local to me I decided to go along on both days. The Friday was by far the busier day with lots of sellers in the outdoor flea-market with a genuine ‘buzz’ which seemed lacking on the Saturday, there were a lot less sellers outdoors. The main hall left me a bit underwhelmed, the layout seemed a bit messy and some areas were cramped while others seemed to have acres of spare room. It was also very hot in the main hall especially on the busy Friday, however it was still an enjoyable couple of days and met up with some fellow tweeters and operators. My purchases were modest and as well as the usual connectors and cabling I picked up a nice as-new 7A regulated linear power supply, a foot switch, a replacement satellite Quad-LNB, a very sorry looking 70cm linear amplifier and picked up one of those lovely Czech morse-keys for when I brave doing the code! I also picked up this little 2.4GHz B/W video monitor for a whopping £1 and it works a treat. I have a number of 2.4GHz wireless security cameras (purchased back in 2009) intended for a PC-based PVR CCTV system but the whole PC system proved unreliable so they are sitting idle. This little monitor can receive on the four standand channels and as a bonus runs off 13.8V so ideal for sticking in the car and driving around the local housing estate eavesdropping on other similar cameras – I am joking of course! 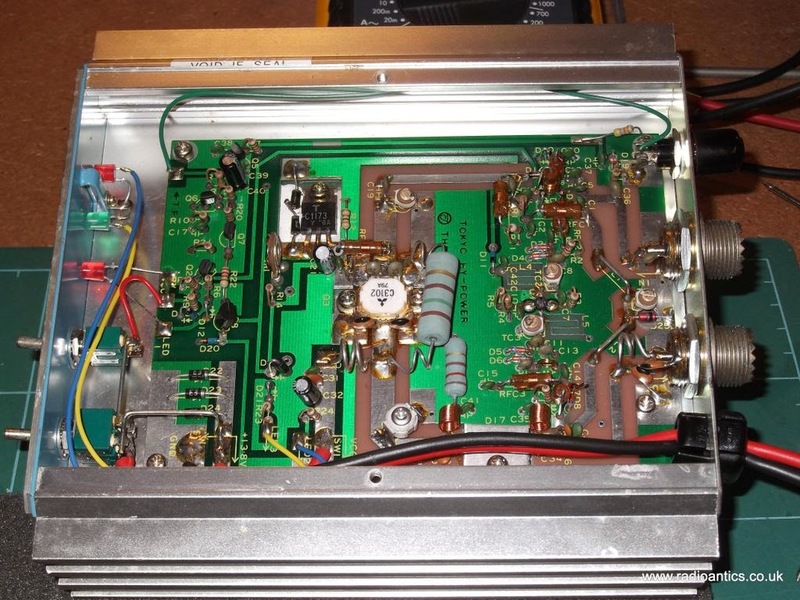 The very sorry looking 70cm linear amplifier is a Tokyo Hy-Power HL-60U. I found it hiding away in a box of junk on one stall and after a bit of haggling got it for a fiver! From its appearance I really didn’t expect it work, especially since the warranty seal had been broken. 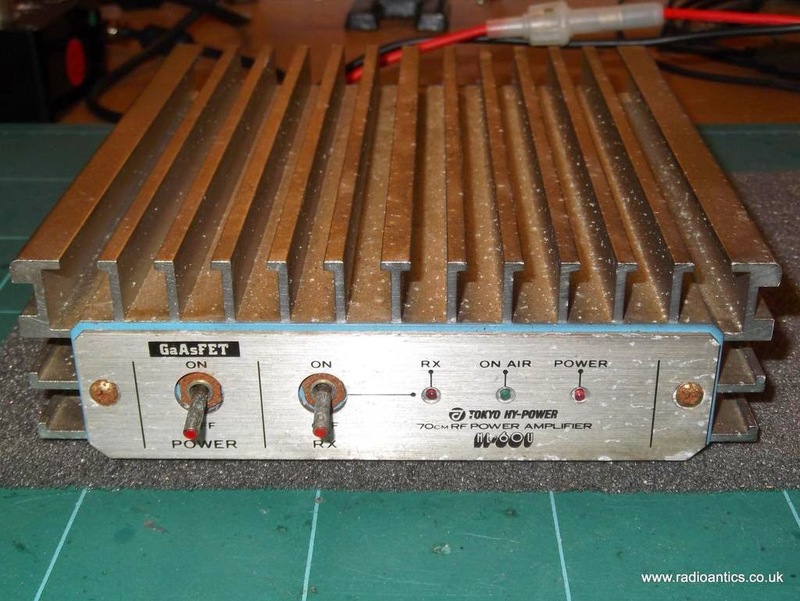 I wasn’t too bothered about the power amplifier I was far more interested if the built in GaAsFET pre-amplifier still worked. Getting it on the bench I opened the case, expecting to find it plundered and butchered and was pleasantly surprised to find the insides looked almost pristine. I think the main PA transistor may have been replaced, but while it looks a bit messy the flux resin around its joints looks the same as other areas of the PCB so not sure. It looks slightly different internally to some another photographs I found on line and I have searched the web for a manual and schematic with no joy. Tokyo Hy-Power went bankrupt last year and the website and precious data downloads have all but disappeared. As it looked intact with nothing missing I connected up the dummy load, power meter and fed the input from one of my Baofeng handhelds. It powered up and was giving 15W out for a measured 3W in with no distortion on the audio, so far so good. 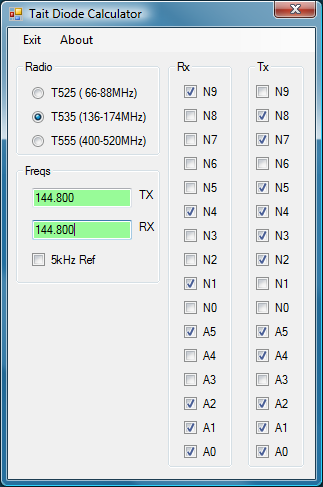 However after connecting up the FT-857D and slowly increasing the input power is became apparent that 15W seemed to be about the limit of its output, not the 60W as promised. Removing the dummy load and putting it on the X-50 antenna I had a listen around for weak stations to checked the operation of receive pre-amp and it worked! Should prove useful for the 70cm contests.